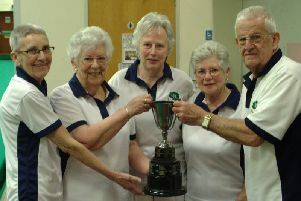 Rugby Thornfield Indoors Bowls Club held their first charity gala of 2019 with a full set of 16 teams taking to green to raise funds for the Warwickshire and Northamptonshire Air Ambulance. With cake sales and name the teddy the afternoon raised just under £380 for the charity. Four teams were in joint first after the initial set of games, “Here Again”, “Ever Hopefuls”, “Misfits” and “Tina’s Lot” all on 7 points. “Uno Our Name”, “One For A Reason” and “X Rail” were a point behind with “The Hoverers” another point back completing the group of teams to win their opening games. Heading into the midway break “X Rail” joined “Tina’s Lot” in joint first. Third place two points behind were “Misfits”, “Ever Hopefuls” were in fourth with joint fifth going to “Uno Our Name”, “One For A Reason” and “Odds & Sods”. “X Rail” took sole control of top spot after the third round of games, just one point clear of “Tina’s Lot” in second. Two points further back were “Misfits” who were a point ahead of fourth place “One For A Reason”. Fifth spot was shared between “Odds & Sods” and “Odd Bunch”. Pat Quirke, Ron Davies, Ian Kendall and Bruce Truman aka “X Rail” took all eight points in their final game to win the gala with 28 points. “Tina’s Lot” had to settle with second place on 25 points, two points ahead of “One For A Reason” in third. 20 points secured fourth spot for “Odd Bunch”, while one point further back in joint fifth were “Misfits” and “Odds & Sods”.